This essay tries to establish that all the basic spiritual knowledge associated with the sanatana dharma are in the four basic books in Vedic Sanskrit having the names Rig Veda, Yajur Veda, Sama Veda and Atharva Veda. Each verse or mantra of these books has simultaneously a surface meaning, and a deep meaning which indicates the hidden spiritual knowledge. This hidden knowledge can be restored by recovering the hidden meaning of the key-words in the Rig Veda. Most of the words occurrence in the Rig Veda can be traced to these 600 key words as indicated in this essay. Thus to understand the veda, the veda itself is the key. It is a big mistake to try to understand the veda using the books such as Purana’s which are of a much later origin. This essay has 10 sections. Section 3 gives the replies to the usual criticisms of the spiritual interpretation. Sections 4 and 5 deals with the principles of the meaning assignment and the spiritual meaning of the words in Rig Veda. Sections 6 and 7 discuss the nature of the many gods or deva’s in the veda and shows that they are all aspects of One Supreme being, mentioned as The One (Tat) or That One (that-ekam). Section 8 reveals how the Upanishads convey these basic ideas in an intellectual format and quotes specifically many verses from the Rig Veda. a) What are the various books in the collection called Vedas in the broad sense of the word? b) Does this collection have a core? c) If so, what is it? d) What is the connection between this core and other ancient books of knowledge like Upanishads? e) What is the connection between this core and the ancient texts of yoga and Tantra? f) What is the relevance of these texts to modern spiritual seekers? g) Does this core of the Vedas indicate new paths of spiritual knowledge? h) What does this core of the Vedas say on the ontological questions of the One and Many, Man and God’s, This world and other worlds? i) Are there other modes of knowledge besides intellectual knowledge, which is the type of knowledge made familiar to most of us because of advances made by western science and technology? The above questions are of interest to serious students of Indian culture whether they are Hindus or not. The primary reason why one should read the core of the Vedas, the so called Rig Veda Samhitā, is that it provides answers to most of the above questions. However, a casual reader of the Rig Veda Samhitā finds only hymns to various Devās or Gods and the answers to the various questions raised above are not clear. The meaning of the hymns of Rig Veda will be transparent only if we remember, while studying the texts, the comments provided by Sri Aurobindo and Sri Kapāli Sāstry. Both Sri Aurobindo and Sri Kapāli Śāstry suggest that Vedas have at least two interpretations, the surface or the external interpretation and the internal or esoteric or symbolic interpretation. The external interpretation has been the basis for most of the standard Sanskrit commentaries like that of the great medieval scholar Sri Sāyaņāchārya or the English translations and commentaries authored by western indologists and their Indian followers. Obviously one cannot get the internal meaning of the Vedas from these texts. The translations and commentaries on the Vedas by Sri Aurobindo  and Sri Kapāli Śāstry [1,2] and their disciples like Sri M.P. Pandit  give us a map to understand the esoteric meaning. Based on these sources, Kashyap has translated into English all the mantra in all the four Vedas, (Rig Veda, Yajur Veda, Sama Veda and Atharva Veda) in 26 volumes  the books giving both the Sanskrit text of the verses and their translation. Only by understanding the esoteric sense of the Vedas we can get the ability to find in them the answers to the various questions posed earlier, and the relevance of the Vedic knowledge for moderns. Three objections are often raised about parallel interpretations of the Vedas. We will discuss them in Section 3. 1. Rig Veda Samhitā consisting of riks. 2. Yajur Veda Samhitā consisting of mainly yajus and some riks. 3. Sāma Veda Samhitā consisting of sāman. 4. Atharva Veda Samhitā. Consisting of mainly riks. In addition, the Yajur Veda Samhitā has two versions labeled Shukla (white) and Kriŝhņa (mixed). All these hymns are revelations to various sages who rearranged them into metered hymns. The arrangement of the four collections is traditionally attributed to the sage Vyasa. Vyasa in Sanskrit means editor. There is considerable overlap in the four Samhitās. Most of the Sāma Veda Samhitā and more than one half of the Yajur Veda Samhitā is a part of the Rig Veda Samhitā. Thus, the core of the Samhitās is the Rig Veda Samhitā. It has about one thousand hymns arranged into ten books called maņdalas. Each hymn has several mantras or verses and the total number of verses is about ten thousand. Each hymn also has the name of or Riŝhis to whom the contents were revealed and the name of Devatas or Gods to whom the hymn is addressed. Atharva Veda has been handled disrespectfully, to say the least, by the western indologists and their Indian followers like B.K. Ghosh. Atharva Veda contains a large number of wise maxims (subhāŝhita) well known in Sanskrit. Some of these along with their verse references are in the book by Kashyap entitled, “The Essentials of Atharva Veda’ . Some occidentals even assign the date of 1200 CE (Circa) for these maxims. In addition, the Hymn to the Earth with its 56 verses which is in the book 12 of Atharva Veda is the earliest reference to the Earth as a self-sustaining entity with persons speaking many languages. Veda – Through the ages All the Vedas have been preserved by oral transmission. Even after more than five thousand years, the text of the Veda chanted today is almost identical to that chanted five thousand years ago. There are several methods of chanting which taken together indicate any error in recitation and would also help in locating the error. This method of information preservation is very reminiscent of the modern methods of transmission of information employing error detecting and error correcting codes. The oldest hand-written manuscript of the Veda written on palm leaves is dated Circa 1200 CE. The first printed version of the Rig Veda Samhitā published in 1864, is due to the popular orientalist Max Muller. In the Veda Samhitā period, the dominant mode of knowledge was intuition. The hymns record intuitive experiences of various sages. Hence, there is some repetition. When a hymn is intoned, the cosmic power or deva invoked by that hymn reveals the necessary experience. Here meaning and experience are identical. The mode of intellectual knowledge developed later. Branches of Veda The creative age of the Samhita also came to an inevitable end. Different aspects of the truths contained in the Samhita were re-expressed in different ways in different books such as Brāhmaņas, Upaniŝhads and the Tantras. Immediately after the Samhitā age, we have the ritualistic age, when some of the truths and experiences in the Samhitā were expressed in the form of rituals. The idea is that if the rituals are appropriately performed, the performer gets the appropriate experience, the experience originally obtained by the sage who formulated the hymn, just by invoking the hymn. The Vedic books which describe the principles of rituals and their associated activities like the altar construction, etc., are called Brāhmaņas. All the Vedas have Brāhmaņas, texts associated with them. For example, Rig Veda has the Aitareya Brāhmaņa, the Shukla Yajur Veda has Shatapatha Brāhmaņa, the Kriŝhņa Yajur Veda has Taittirīya Brāhmaņa, the sama Veda has Tandya Brāhmaņa, Chhāndogya Brāhmaņa and Samavidhana Brāhmaņa and finally the Atharva Veda has the Gopatha Brāhmaņa. It should not be construed that every verse and hymn of a Brāhmaņa text is geared to the ritual. In some parts of Brāhmaņas there are discussions about the ultimate Reality which are intellectual or philosophical in the modern sense of the word. Often the latter parts of some of the Brāhmaņas, called āraņyakas, contain a mixture of ritualistic doctrine and intellectual discussion. Two well-known āraņyakas are the Aitareya Aranyaka associated with Rig Veda and the Taittirya āraņyaka associated with Kri ŝ hņa Yajur Veda. Finally we have the vedic texts called Upani ŝ hads. Upani ŝ hads contain spiritual experiences couched in the language of the intellect and hence these can be easily understood by those with an intellectual bent of mind. 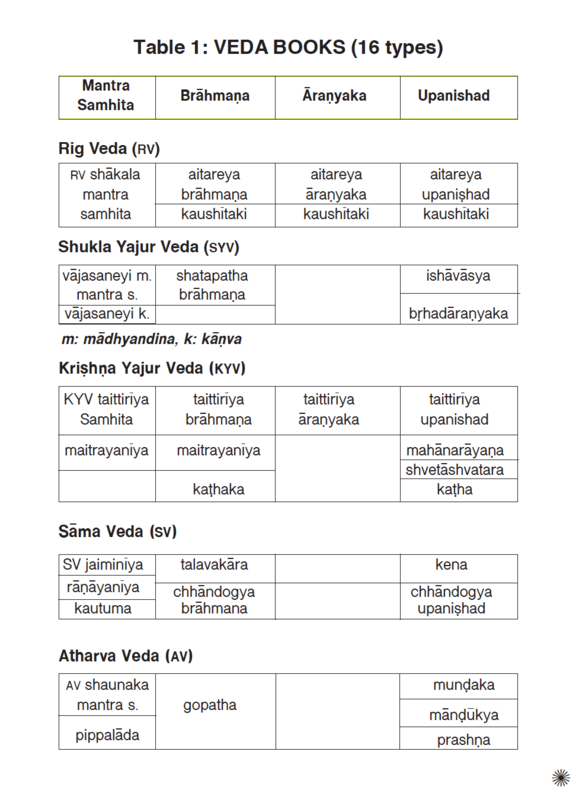 The main Upanishads with their associated Veda are displayed in Table-1. At the end of the first section entitled, “Introduction’ we mentioned that every verse of Rig Veda has at least two different or parallel interpretations, the so called surface meaning, and the esoteric view which gives the deep wisdom in these verses. The first objection is that in most of the current languages of today, one cannot envision several parallel interpretations even in small poems. Consequently, it is difficult to envision parallel interpretations in a composition of more than 10,000 stanzas. Furthermore, can we envision such parallel interpretations in Sanskrit? The answer to this objection is simple. Sanskrit is not like any other language, ancient or modern. Experts who have been working in the area of knowledge representation and computational linguistics have been amazed  at the precision in Sanskrit which is not available in other languages. Several examples are available in classical Sanskrit of stanzas having several different interpretations. For instance, a stanza of 4 lines is given in  which can be interpreted as a hymn to Shiva, a hymn to Viŝhņu and as the decimal representation of the number pi (ratio of the circumference of a circle to its diameter) using the standard code for converting integers to the Sanskrit alphabet (For details, see Appendix1). Finally, it is not as if a reader is asked to blindly believe in the esoteric interpretation of the Veda. Sri Kapāli Ŝāstry has written a detailed commentary on every verse of every hymn in the first eighth part of the Rig Veda (121 hymns) pointing out the esoteric interpretation and the limitations of the external or surface interpretation of the Veda. This information is available in English in the book [1,3] mentioned earlier. The second objection is why would the authors of the Vedas hide their real meaning? The answer to this question is straightforward. Nobody wants to hide the truth, but not all persons have the same aptitude for understanding the text. As one chants the hymns and meditates upon them, they gradually reveal their full meaning. An entity is evaluated by individuals in the light of their past experiences. This is best illustrated in one of the stories told by the great teacher Sri Ramakri ŝhņa . “A rich man gave a precious diamond to his servant and asked him to have it appraised by several different persons having different amounts of capital. The servant went first to the seller of eggplants who said that the diamond was not worth more than nine seers (a weight measure of about a pound) of eggplant. Next, the servant went to a cloth merchant whose capital is substantially more than that of the eggplant seller. He said that the diamond is a good thing and offered to pay nine hundred rupees for it. Next, the servant went to a diamond jeweler who offered one hundred thousand rupees for the same diamond. One offers a price according to one’s capital. Take a living incarnation of God. Some take him for an ordinary man, some for a holy man, and only a handful recognize him as an incarnation.” The third objection to parallel interpretations of the Vedas is that whereas they have been around for more than five thousand years, why is it only Sri Aurobindo has recognized its esoteric meaning? Even the famous commentator Sri Sāyaņā chārya does not deny the spiritual meaning of Veda. Secondly, there do exist Sanskrit commentaries which uphold the spiritual interpretation. The most famous of these is due to the great teacher of dualist Vedanta, Sri Madhwāchārya, who predates Sri Sāyaņā chārya . Sri Madhwāchārya affirms that the Vedas have three parallel interpretations, namely interpretation for use in a ritual, interpretation as hymns addressed to the cosmic powers or Gods, and finally, interpretation as hymns addressed to the Supreme One. The sixteenth century South Indian saint Sri Raghawendra Swami, a spiritual descendent of Sri Madhwāchārya, wrote a detailed gloss on the first 40 Suktas of the Rig Veda Samhitā, pointing out all the three interpretations. The two distinct views of the Veda, namely the surface view and the deep or esoteric view arise from the fact that many of the frequently occurring words in the verses of Rig Veda have simultaneously a surface meaning and a deep meaning. This is described in Section 4 and 5. Note that according to the Hindu tradition, Rig Veda is our most ancient treasure. The books such as Purāņa’s are dated several millennia after the Rig Veda. Thus to explain the mantra’s of Rig Veda based on the myths and legends in the Purāņa’s is unwise. Again Rig Veda is not a small book, it has more than ten thousand mantras. All the four vedas together have about 23,000 verses. Thus only Veda can tell us about the Veda, i.e., for any clarification we need about a word or a concept in a mantra, we need only look at the occurrences of that word or the concept in other places in the Veda. Of course, one must have intimacy with all the mantra’s. To fix the meaning of a word, we have to study all the mantra’s in which the word occurs. This is the basic principle referred to as P1, in our approach to the meaning assignment. P1. Veda can be understood only with the help of Veda. Our next principle is P2. P2. The test of validity of the assigned meaning of a certain words is that all mantra’s having this word should have coherent meanings. P2 is a consequence of our belief that the Riśhis , the poets of these mantr¢s were highly sophisticated and wise, dedicated to the goal of all-round perfection. They were engaged in the practice of tapas, over a long time. It is unlikely that such poets would give us poems involving any confusion. Of course, persons who have no background in understanding the spiritual experiences may declare that “these poems are vague or confusing’. Recall that every mantra is made up of two distinct parts, at least. If the meanings of these 2 parts are completely unrelated, then the assignment of meanings to some of the words in them is presumably wrong. Some examples of this type have been indicated in Section 1.
all this evidence, it is hard to explain why translators like Griffith render it only as a herb. P4: Most of the words in the Veda have only one general meaning. Different occurrences of this word have only minor variants of this basic meaning. Battle: “The force was not sufficient to relieve the garrison’. Psychological pressure: “She could not force her views on the committee’. P6: Consider the compound words which are functionally related to each other. Their meanings should also be related. To illustrate, consider the word gh¨ta, which occurs about 110 times in RV. Its common meaning is ghee or clarified butter. The use of this meaning does not make any sense in many places. Hence S¢ya´a gives a variety of meanings for the same word including, “”water”, shining or luminous etc., presumably to have some local consistency. Even the assigned meaning often does not make any sense. In (1.13.5), we have gh¨ta p¨¾h°ham meaning dripping or coated with ghee. However, the context is “seats’. The phrase, “seats dripping with ghee’ does not make any sense. In (1.14.6) the same phrase occurs in the context of steeds. Again ghee “dripping from the horses’ is incoherent. In (1.85.3), (1.87.2) gh¨ta itself is translated as heavenly waters. For all the words with “gh¨ta’ as a prefix, gh¨ta can only be light; see the “gh¨ta’ discussion in chap. 9, of the book . P7. Sometimes the ordinary meanings of the words suggest their more abstract esoteric meanings. Example: Consider adri, hill. Its hardness and immobility suggests the alternate meaning “the psychological force of inertia’. With its many peaks and plateaus, it also suggests “existence’. The mantra (1.7.3) states: “”with the rays (knowledge), Indra smashed the hill (adrim)”. Take the word Ashva, whose ordinary meaning is horse. Horse itself suggests something having excessive life-energy. The Ashva is a key word; its word-family with its repetitions has about 200 members. To focus on the meanings of the words, we have to go to the padap¢°ha of Rig Veda which displays all the distinct words in each verse distinctly. Rig Veda has about 32,000 distinct words. In this listing, Vibhakti variants of a word agni, such as agnina, agnim etc. are regarded as distinct words. We focus on ascertaining the meanings of nouns and verbs; isolated particles such as cha, api etc., all verbal forms of “to be’, all pronouns are not important. An important aspect of the Rig Veda is that a small set of root-words, numbering about 600 account for most of the word occurences. A root-word from which all its case variants and number variants are derived. For instance agni, the single root word subsumes all its case and number variants. we aim to fix the meanings for each one of these key words by studying the set of all the mantra-s or verses in which each one occurs and discover the meaning of the word common to all the members of the set. As Sri Aurobindo declares, Veda reveals its own secret by a detailed and sincere study. A detailed study of the words is in our book “Semantics of Rig Veda’ by R.L. Kashyap,  pub. SAKSI (2006). One cannot fix the meaning of a word in isolation. Any systematic method for assigning meanings to words must recognise the group of closely related words and make distinctions in their meanings. For example, take the key words such as manas, man¤¾ha, medhas, prachetas, praketa, all connected with mental operations and consciousness. In the translations of R.T.H. Griffith, manas is rendered in various ways such as mind, spirit, wisdom etc. manas in the Veda has a fixed meaning. A. Root-Words connected with human beings, their psychological attributes, artefacts and environment. B. Root-Words related to the cosmic powers, known as Gods and demons. Word-groups Based on this analysis, the root-words in group A have been divided into 10 groups. In all, there are 295 words. Note that we have given only some representative words in each topic. Many more are there. The group A1 has 75 distinct root-words, indicated by the number in parenthesis. For each word, we will give in parenthesis the number of mantr¢s in which this word and its vibhakti variants occur (i.e., the sum of the total number of mantr¢s in its occurence set and the occurence-sets of the case variants of the word). There are 74 root-words here. The total number of verses in RV which all the 74 root- words of A1 occur is 9469. ¢k¦taye, chittaye, mati, shruti, chak¾huse and dhiya. that Rig Veda is full of rites. The great scholar Sayana in his eagerness to associate each mantra with some rite gives completely arbitrary meanings, especially the meaning “food’ to many words. Why translate dhi as food when the standard meaning of thought or intellect is valid? “”By a careful and minute study of its word-families it is possible to a great extent restore the past history of individual words. “”It is possible to account for the meanings actually possessed by them, to show how they were worked out through the various stages of language-development, to establish the mutual relation of different significances and to explain how they come to be attached to the same word in spite of the wide difference and sometime even the direct contrariety of their sense-values. It is possible also to restore lost senses of words on a sure and scientific basis and to justify them by an appeal to the observed laws of association which governed the development of the old Aryan tongues, to the secret evidence of the word itself and to the corroborative evidence of its immediate kindred”. 6. Who Are the Gods? A deep understanding of spirituality, interpreted in a broad sense, is not possible without a good understanding of the nature and role of Gods mentioned in the Rig Veda. Before proceeding further, it is important to distinguish between the capitalized word God and Gods in the plural. God refers to the supreme principle which is the substratum of all existence. On the other hand, “”Gods” refers to different aspects, powers and personalities of the supreme God. To avoid confusion, it may be better to replace the word God by another word like the Divine. Even the word Brahman is a source of confusion since it refers to the Supreme One in some contexts and also to a God representing a creative aspect of the Supreme One. It is important to remember, especially in the Vedas, that when a reference is made to the Supreme One, there is no attempt at denying the different manifestations of the One. Both the One and the manifestations are real. different states of consciousness. A human being who is conscious of only matter is at that time living in the world of matter. When his consciousness is dwelling on desires, feelings, emotions, etc., then he is living in the vital world. When he is immersed in thought, then he is in the mental plane or world. The God Agni presides over the world of matter, the God V¢yu presides over the vital world, (or the world of pr¢´a) and the God Indra over the mental world. Most human beings are conscious of only the three lower levels of existence. The meaning of the Gods is not exhausted by their descriptions as rulers of different planes. Let us take the God Agni. Agni, of course, in the physical sense stands for the principle of fire. But even in the first hymn of Rig Veda the God Agni is described as a herald, a priest and as one who leads all other Gods towards the worshipper. Western academics have been wont to dismiss these epithets as typical exaggerations conferred on an anthropomorphic conception of the God Agni. The classical commentator Sri S¢ya´ach¢rya explains these epithets in terms of pur¢´ic stories which are often contradictory. Sri Aurobindo and Sri Kap¢li S¢stry explain that the God Agni in the esoteric sense stands for the principle of aspiration in man to achieve higher things than his present state. Progress is not possible without aspiration. Hence, only if Agni is active, can he bring in the other Gods or powers, i.e., the other powers can manifest in man. Thus, at the start of Rig Veda Samhit¢ the sages describe spiritual progress as a journey from one peak of the multi-tiered hill to another. This conception is clearly very modern, but it is a paraphrase of verse RV (1.10.2) of the Rig Veda Samhit¢. Many scholars of the Vedas make the mistake of measuring the degree of importance of a God by the number of hymns addressed to the God. Such an approach is fallacious. Many hymns are addressed to Agni because aspiration is the most important element in spiritual practice. One should distinguish between a path and the goal. The goal is the attainment of the consciousness of the Supreme in all its manifestations. The Rig Veda itself says that the God Vi¾h´u is in the highest tier or plane and self-realized sages have their consciousness enveloped in him “”like a ray connected to heaven.” Yet the number of hymns dedicated to Vi¾h´u in the Rig Veda is very few, less than half a dozen. As Sri Aurobindo says, gods are not personifications of qualities or powers, but incarnations or emanations of conscious forces with whom we can enter into concrete touch and they can help man and show him the way to a divine consciousness and immortal life. The esoteric interpretation recognizes in Rig Veda an unknowable, Timeless and Unnameable behind and above all things; it is not sizable by the studious pursuit of mind [for example, see RV (1.170.1) in Section 7]. Impersonally it is That, the One Existence (ekam sat, 1.164.46; tat ekam 10.129.2). To our intuition it reveals itself out of the secrecy, as the gods or deva-s.
1 Indra increases our new life and creates ri¾his, the thousandfold enjoyers. navyam ¢yuª pras¦tira k¨dhi sahasras¢m ¨¾him (1.10.11). and mind. Naturally a large number of mantr¢s are dedicated to these three deities. 2000 mantr¢s to Agni, 2500 to Indra and 1900 to Soma. They together account for 6400 mantr¢s out of the total of 10,552. V¢yu: Wind; He is the Lord of all the Life-energies, Pr¢´a which represent the passions, feelings, emotions and abilities. Ashvins: The Lords of Bliss and Divine Physicians who render the human body free of disease so that it can accept the divine Pr¢na, the life-energy. Varu´a: The Master of Infinities who cannot tolerate restrictive thinking or actions. Only he can cut the three bonds which restrict the three aspects of every human being— physical, vital and mental. Sarasvati: The Goddess of inspiration. I¶¢ (I!a): The Goddess of revelation. Saram¢: The Goddess of intuition. Surya: The Supreme Deity of Light and Force. In the list below, Agni (1500) means that the word agni along with its case (vibhakti) variants occurs in 1500 verses of RV. J¢taveda, Vaishvanara also refer to the mystic fire. The vedic seers, like their vedantic counterparts later, clearly state that the One, though unknowable to the human mind, can be experienced because of the existence of several layers of consciousness beyond the level of mind in the humans. The whole of the Veda Samhit¢, especially the Rig Veda Mantra Samhita, is a record of their spiritual experiences and the description of the paths leading up to these experiences. The s¢dhana or the methods of the vedic seers is, of course, different from that of the vedantic seers. Vedic seers do not state the Truth in terms of exclusive categories, as modern intellectuals do. Intellect is always analytical in nature; it always wants to divide anything or any concept into its components and always tries to find distinct characteristics in each object or concept so that it can be distinguished from the others. But experience is always synthetic in character. Different images which may be quite different to the intellect come together in the higher reaches of consciousness. The Vedic seers do not make rigid and mechanical distinctions between the One and the Many. “”The Brahman, the One Existent, spoken of impersonally in the neuter, is also seen as the Deva, the Supreme Godhead, the Father of things who appears here (on earth) as the son in the human soul,” (Sri Kapali Sastry). Each of the Gods like Agni, Indra, is a manifestation, an aspect, a personality of the Supreme Godhead. The One existent can be realized through any one of these Dev¢s or Gods for each Deva contains all the other Dev¢s in himself or herself. cannot be comprehended by the mind. It uses the same phrases to describe the Brahman used much later in the Upani¾hads. For instance, consider RV(1.170.1) given below. na nunam asti na shvaha kastat veda yat adbhutam anyasya chittamabih sancharenyam ut¢dh¤tam vi nashyati. The word “”adbhutam” means both wonderful and transcendent. This verse will be explained in detail at the end of this section. Tat is spoken of in the neuter as “That’ and often identified with the Immortality, the supreme triple principle, the vast Bliss to which the human being aspires. The Brahman is the unmoving, the oneness of gods. This statement is a refrain in the entire S¦kta RV(3.55) due to the Seer Praj¢pati Vishv¢mitra. Note that the vast is not an adjective of mightiness (as done in some translations), but is an independent description of the One. ekam sat vipra bahuda vadanti agnim yamam m¢tarishwanam¢huhu. “”It is the One Existent of whom the seers speak variously Agni, Yama, M¢tarishwan…”. Another reference to the One is RV(10.114.5). “”The One existent, beautiful of plumage, the illumined seers by their words formulate in many ways (or forms)” (10.114.5). RV(3.54.9, 3.56.2, 5.62.1, 6.9.5, 8.33.10, 10.82.2, 10.82.6, 10.114.5). In the vedic conception, the Truth of the “”One” and the Truth of the “”Many” are not antithetical. The “”One” manifests itself through the “”Many,” but it is not limited by the “”Many.” Each Deva (it is better to use the Sanskrit word instead of the English “”god” because of the natural mis-associations of the latter word) has a different name which not merely indicates the different powers and personalities of the indicated Deva, but also a means for invoking the presence of the Deva. Note the use of the word “”see” (pashyema) in the above mantra. When the seers chant the glory of the individual Dev¢s like Agni, Indra, Maruts, Sarasvati, etc., they are aware not only of that particular aspect associated with the One, but they are aware of the One also. They are not like the proverbial blind men describing the elephant – each blind person can touch and feel a particular part, but has no understanding of the complete elephant. The evidence for the awareness of the One even when they are describing the individual Devas can be found in many hymns. Even though Indra is one of the Devas, he still embodies the consciousness of the One so that all the deities abide in Indra. Next we mention the mantra RV(2.1.3) in which Agni is identified with all the Gods including Vi¾h´u, the all pervading God of the Rig Veda. You Brahma´aspati are the Brahma, the finder of riches, You sustainer, unites us with wisdom”. In the later Pur¢´¢s and Tantr¢s we see each devotee worshipping his own favorite deity “”i¾h°a devata” and realizing the other deities and the Supreme One through the “”i¾h°a devat¢.” This view is nothing but an echo of the proclamation of the Vedic seers like Dirghatamas who realized all other deities through the deity Agni. It is customary to find in many books on Indian philosophy the statement that the authors of the Upani¾hads opposed the Vedas on the grounds of ritualism and developed alternate intellectual theories detailed in the Upani¾hads. There are several inconsistencies in this statement. First of all, Upanishads are not philosophic texts involving metaphysical speculations. These texts describe the variety of spiritual experiences of various sages called as darshana. There are no speculations in these texts. Secondly, the sages of the Upani¾hads did not reject the Veda Samhit¢s as such; they only claim that they have either discovered new truths fully compatible with the Samhit¢s or they are amplifications and generalizations of some of the seed ideas in the Rig Veda. To substantiate their viewpoints, they often quote some mantras of the Rig Veda. One of the great contributions of Sri Kap¢li S¢stry is to delineate the precise connection between the Rig Veda and the Upani¾hads. The Upani¾hads, besides delineating various spiritual experiences, also give a few hints on s¢dhana, i.e., paths of spiritual realization. These methods of s¢dhana are called vidyas. The Upani¾had does not give much detail about the vidyas because such details cannot be conveyed in print. Typically, a teacher transmits these truths to the students, often in silence. There are more than a dozen vidyas mentioned in the Upani¾hads. Sri Kap¢li S¢stry’s book “Light on the Upanishad’  is the only one, as far as the author is aware, to discuss these vidyas in some detail. Madhu Vidya of the B¨had¢ra´yaka Upani¾had and the Vaishwanara Vidya of the Chh¢ndogya Upani¾had are taken up here to relate their connection to appropriate passages in the Rig Veda Samhit¢. The madhu vidya or the doctrine of mystic honey is found in the 5th chapter of the second book of the B¨had¢ra´yaka Upani¾had which is itself part of the Shatapatha Br¢hma´a. Often this Upani¾had is quoted by some monists to demonstrate this world to be an “”utter illusion” and that it is irrelevant to the attainment of the highest spiritual experience called as nirgu´a brahman. Such passages upholding the “”lofty illusionism” are found in the Maitreyi Br¢hma´a of the same Upani¾had which precedes the madhu vidya chapter provides the required corrective and teaches us that the “”diversity in creation is the manifestation of a secret delight, that all things, however heterogeneous and warring they may appear, are held together by a secret harmony effected in them by the hidden creative self delight of the Supreme who is the effulgent self, Immortal.” The Upani¾had states “”This earth is honey for all beings and all beings are honey for this earth – and he who is in this earth the effulgent, immortal puru¾ha and he who is within one’s being, in the body, the effulgent, immortal puru¾ha are indeed the same – He who is this Self, this Immortal, this brahman, this All.” It gives fourteen illustrations to reinforce the above statement. It further adds that “”this Self does not merely represent the basic principle of madhu, the Bliss that abides in the heart of things but he is the Master of all things and beings and holds together all beings, all Gods, all worlds, all selves and all lives.” Next the Upani¾had quotes three verses of the Rig Veda Samhit¢ (1.116,12; I.117.22, 6.47.18) stating that the doctrine of mystic Honey given here is not new, but was already revealed to the sages of the Rig Veda, specifically Dadhyan atharvan by Ashvins, the twin powers. agni mentioned in numerous hymns of the Rig Veda. Even though all s¢dhanas of the Upani¾hads lead to the attainment of brahmic realization, their starting points, their approaches, and the results experienced on the way to realization may differ. S¢dhan¢s may differ from one another in their emphasis on different aspects of br¢hma´. The vaishvanara vidya mentioned in the 5th book of chandogya begins with the question “”what do you worship as the atman” posed by the teacher, the king Ashwapathy Kaikeya to eager students who approached him for the elucidation of the supreme realization. The teacher shows the limitations of various answers and teaches them about the Universal person, Vaishv¢nara, who is adored as “”In all worlds, in all beings, in all selves, he eats the food.” The teacher exhorts the students in the art of living in accord with the truths of Vaishv¢nara, the universal person. He enjoins them “”not to eat the food and live as if the vaishv¢nara ¢tman were something separate, but to live – and eat for living – with the knowledge of Him as the One Fire who lives aglow in all creatures.” Such a person lives also for other souls, for other beings around, for the rest of the whole universe. His living is a source of joy and power to all living beings at all levels. He radiates wisdom and life-giving strength. The food he takes is an offering to the Universal Fire. This is the real meaning of the Fire ritual. The vaishv¢nara vidya directly draws its inspiration from the numerous hymns on the vaishw¢nara agni in the Rig Veda. Sri Kap¢li S¢stry gives a detailed discussion on this topic. We will content ourselves by giving references to some of the relevant hymns: Rig Veda, 10.88; 1.59; 1.98.1; 3.3.2; 3.3.4; 3.26.7.
which have their corresponding ones in RV. A systematic study of the Veda and Upani¾hads has not been done. We give here just a few examples. The oft-quoted passage of Shvet¢shvatara Upani¾had (2.5), “Hear ye, children of immortality’, occurs originally in Rig Veda (10.13.1). The same Upani¾had in (2.2) quotes RV (5.81.1). The famous hamsa mantra of Ka°ha Upani¾had (2.2.2), “”The swan that settles in the purity. . . born of truth,—itself the truth, the vast”, occurs originally in RV (4.40.5). The famous mantra of the two birds signifying the individual soul and supreme soul found in Mu´²aka Upani¾had (3.1.1) is originally from RV (1.164.20). It is hardly a coincidence since the word supar´a translated as bird occurs in more than half a dozen verses of RV bearing always the symbol of soul. Some commentators often misinterpret the phrase, “two birds’ in RV (1.164.20) as husband and wife. The famous utterance of Upani¾had that brahman cannot be attained by duality is in RV (5.12.2). The idea that brahman cannot be attained by mere action or effort is in RV (8.70.3) and (5.48.5), brahman cannot be approached by thought is in RV (1.170.1) or Kena Upani¾had (1.3). U. (2.1.5) specifically mentions the mantra of the Ri¾hi V¢madeva in RV (4.27.1) and the name of ri¾hi also. The concept of the mystic heart centre h¨d¢ which occurs more than thirty times in RV is also found in several Upani¾hads. The triplet “The heart, the mind and intellect’ (h¨d¢ manas¢ man¤¾ha) found in Ka°ha Upani¾had (2.3.9 or 6.9), Shvet¢shvatara Upani¾had (4.17) etc., is originally in RV (1.61.2). We may note that the £sha verse (18) is also in the B¨had¢ra´yaka Upani¾had (5.15.1) and the Maitri Upani¾had (6.35). The same verse is in Rig Veda (1.189.1). Take for example the theorem of Pythogoras in geometry. A search in the greek sources reveals only the mention of the Pythagorean triples namely three numbers such 3,4,5 in which the sum of the squares of the first two equals the square of the third. The first complete statement of that theorem in geometry is found in the book, Sulba-sutram of Bodhayana  dated at least prior to 800 BCE. This book deals with the geometry of the construction of vedic altars, whose date may be a millinea earlier. RV (3.59.4) (book 3, hymn 59, verse 4) states that, “the Sun (mitra), upholds (dhadh¢ra) both the Earth and other Heavenly bodies’ (mitra d¢dhara prithivim, uta dyam). Another verse in the same book RV (3.53.8) states that “Indra (Sun) comes from heaven to Earth and returns, three times in a muhurtha’. A muhurtha is 48 minutes. 3 times round trip from earth to Sun is 6 times oneway. For the 6 trips, the time is 48 minutes, i.e., 8 minutes per trip. Now we know that time needed for Sun’s rays to reach the earth is 8 minutes and 15 seconds. Is it coincidence? Based on the altar construction work and others, the american mathematician Seidenberg  states that the origin of mathematics must be attributed to the vedic Indians and not to the Babylonians as done by Vander Warden and others. For discussion on this topic we suggest the paper by R. Narasimha , a distinguished mathematician published in 2015, and the book by Goerge Gheverghese Joseph entitled, “The Crest of the Peacock’ Non-European Roots of Mathematics, (2000 CE) . Many Indologists claim that the concept of rebirth is not in the Vedas; it appears only in later Hinduism. This statement is false. There are several mantr¢s in the Veda affirming the idea of rebirth. We give here one such instance. Note that the concept of rebirth given here is more meaningful than the concept given in Pura´¢s and the one in the popular minds. Note that the ship is both a home and a mode of traveling, i.e., it is the human body, which partakes of much motion spanning over several births. Note that line 4 specifically mentions the births (jan¢nan). Note the phrase “Our spirits of fullness’. Life was never regarded as merely going from one birth to another. In each birth, one completes a stage of perfection, maghona. Some other mantras refering to rebirth are RV (10.59.6), (10.59.7), (10.18.5) and others. Note that rebirth mentioned in RV is not transmigration. 1 rath¢ya n¢vam uta no g¨h¢ya (1), nity¢ritr¢m padvat¤m r¢si agne (2), asm¢kam v¤r¢m uta no maghono (3), jan¢n cha y¢ p¢ray¢ª sharma y¢ cha (4). One of the great contributions of Sri Kapali Sastry* is to dispel the myth that the various Hindu scriptures like the Veda Samhit¢s, Upanishads, yog¢s, Tantr¢s, etc., are disparate and to demonstrate that they complement one another. If each major scripture like the Tantra or Yoga can be compared to a pearl, then Rig Veda is like the string on which all these pearls are strung into a magnificent necklace. The task of studying various scriptures to bring out their beauty and harmony has only just begun. Let us hope that more spiritual aspirants and scholars will take up the task of amplifying the truths which have been stated crisply and briefly Sri Aurobindo and by Sri Kap¢li S¢stry. The translation of a few verses of the last hymn in the Rig Veda Samhit¢ (10.191.2-4) is an appropriate finale to this essay. * Kap¢li S¢stry (1886-1953), started his study of the Rig Veda after his initiation at the age of 5. By the age of 12, he had a mastery of Sanskrit and had read the great commentary of Sayana. Then the idea of the esoteric interpretation got formed in his mind. His insight was encouraged and widened by the great poet, V¢sishta Ganapati Muni (1878-1936) and Sri Aurobindo. Sri T.V.K. prepared his great commentary on the Rig Veda during (1946-1949), available in six volumes of his collected works.